Of all the things on the Thanksgiving table growing up, sweet potatoes were among my least favorites. They were squashy, supersweet, oddly-textured mounds of mysterious orange vegetable smothered in marshmallows, which to be frank would be better suited between a graham cracker and a hunk of chocolate. To this day I still have trouble getting excited when I find them in our CSA box. But sweet potatoes are full of good nutrition, as long as they're not whipped in butter and smothered in marshmallows. This year I was determined to get the sweet potato recipe right for Give Thanks for Friends, and with the help of Epicurious I believe I've done it. This is one sweet potato lovers will fawn over, and the haters might even take a liking to. It draws out the savory side of the mysterious orange root veg, rather than the familiar snow-covered sweet potato casserole I grew up with at my Southern Christmases. This one's for all the people who enjoyed our Sweet Potato and Sausage Gratin with Thyme at Give Thanks For Friends this year (and Jessie, who asked for the recipe after we made it again for house church). Enjoy, and happy early Thanksgiving!! This Bon Appétit recipe will yield 8 servings. You may not need all of the potatoes; reserve any leftovers for another purpose. You can prepare the first three components up to a day in advance: Cook sausages in a heavy skillet until browned and fully cooked. Place sausages in a small bowl and pour off any remaining fat from the pan. Add broth, wine, apricot nectar and 2 tablespoons of butter to the same skillet; boil until reduced to 1 ½ cups (the recipe says about 15 minutes but it took a bit longer when we made it). Pour the liquid into another bowl. A little over an hour before you're ready to serve: Arrange half the potatoes in a 9x13x2" glass baking dish. Sprinkle with 1/3 cup cheese. Top with half of leeks and all of sausage. Sprinkle with half of the thyme; season with salt and pepper. Cover with remaining potatoes. Sprinkle with remaining thyme. Season with salt and pepper. 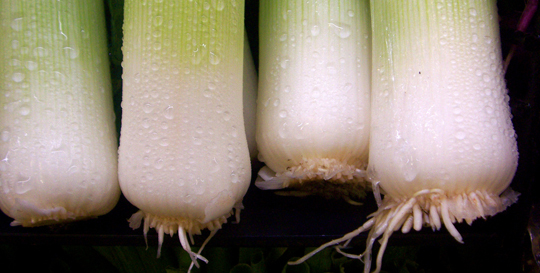 Cover with remaining leeks. Top with remaining cheese. Pour broth over. Cover and bake 30 minutes. Uncover and bake until potatoes are tender and liquid thickens, about 15 minutes. Cool slightly.